Never leave Excel Our tutorial is based entirely inside an actual Excel spreadsheet to maximize your learning retention. Go at your own pace! Learn Excel in as little as 5 minutes per day! Over 40 worksheets, 70 lessons, and 150 Automatically graded exercises. It’s late and your coworkers have all gone home, but you’re stuck in the office. You’re staring at your computer screen trying to remember exactly how that function works. Your boss is standing behind you. You can sense the frustration. In this data-driven world, Excel is the single most important tool you can learn. Virtually every office job requires it. Its been around for 30 years and will probably be around another 30. Take a minute to estimate how many hours per week you actually spend in Excel. Project that number out to an entire year. Many of you will spend hundreds of hours staring at spreadsheets this year, thousands of hours of your entire career. Now, what if you could double your productivity and cut that time in half? How much time could you save? One hour per day? Two hours? That’s extra time that you can use to work out, spend time with your kids, get more sleep, or get even more work done. I know what you're thinking... Sure this sounds nice, but is this realistic? We’ve actually run experiments where we took beginner Excel users and had them complete tasks, taught them keyboard shortcuts, and then had them repeat the task. Many users were able to complete the task in half the time (or less)! In fact, between learning keyboard shortcuts, new functions, commands, and other time-saving best practices, we estimate that a typical Excel user can easily see a 2-4x increase in productivity from Spreadsheet Boot Camp. We're so confident that Spreadsheet Boot Camp will save you hours of time, that we have a no questions asked, money-back guarantee. Why should you choose Spreadsheet Boot Camp? You control the pace! Skim topics you already know and spend extra time on brand new material. Spend as little as 5 minutes per day! Spreadsheet Boot Camp was designed with psychological principals in mind: You learn best by doing. Work smarter, not harder. We emphasize keyboard shortcuts and other Excel "best practices" to help you get more done in less time. 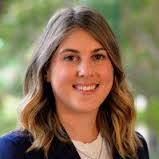 "Spreadsheet Boot Camp was a life saver"
"Spreadsheet Boot Camp taught me invaluable skills. By mastering Excel functions and shortcuts, I have been able to spend less time organizing data and instead focus my time on the tasks that really matter." "My Excel skills earned me an early promotion and a raise!" I was amazed at what I didn't know! I considered myself fairly knowledgeable about Excel, but there were tons of functions and features that I had never heard of, and shortcuts for everything I could imagine. I had no idea what Excel could do. What might take one of my coworkers an entire day of scrolling down spreadsheets, copying/pasting values, I could do in less than an hour using complex Excel formulas and keyboard shortcuts. During busy season while my coworkers were working 80+ hour weeks, I was taking on extra projects and still working much fewer hours. I became the go-to Excel person. Team members of all levels would come to me with questions. People were blown away with my ability to get tasks done without using the mouse. The time that I saved allowed me to focus on the content of what I was doing, which helped me get ahead of other people in my start class. At the end of my first year, I was given the top performance review possible, and a promotion. Typically only 1-2 first-years across the entire United States receives a promotion of this type. I consider myself smart and hard-working, but there's no way I would've received that promotion if I didn't put in the effort to master Excel. Whatever time I spent to learn Excel, I earned back at least 10x over in my first-year. Not to mention, the raise and promotion that I received. What sets Spreadsheet Boot Camp apart? "Designed with human psychology in mind... Retain up to 90% of the material!" With traditional Excel courses that utilize passive learning methods(lectures, readings, or watching a demonstrations) you will retain only 5%-30% of the material. Spreadsheet Boot Camp is designed with human psychology in mind. You can retain up to 90% of the material​ from our fully-immersive "boot camp" learning methods! ​With Spreadsheet Boot Camp, you will learn Excel as quickly (and painlessly) as possible! 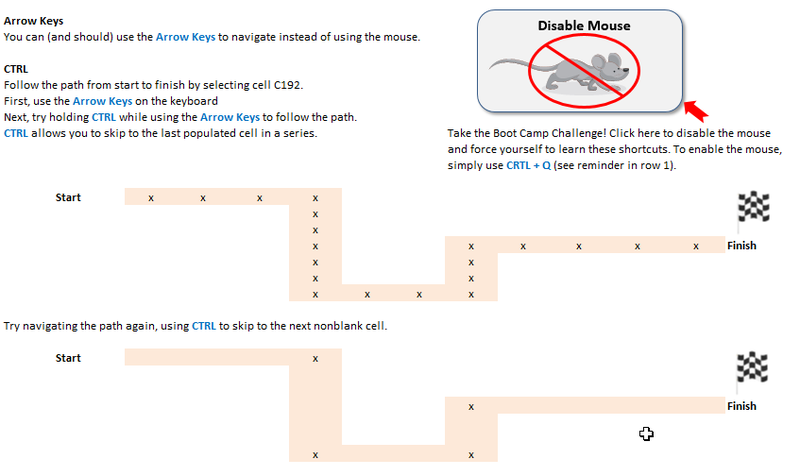 Spreadsheet Boot Camp focuses extensively on time-saving keyboard shortcuts. Using the keyboard to navigate and select cells is a HUGE time-saver. 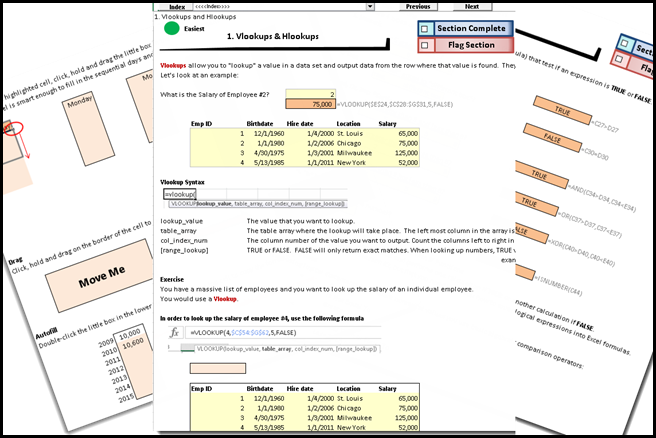 Our tutorial focuses on training you to use the arrow keys, CTRL, SHIFT, and more to FLY around your Spreadsheets. We even give you the option to temporarily disable the mouse and complete the tutorial entirely with the keyboard. This "Boot Camp" approach allows you to learn as quickly as possible! 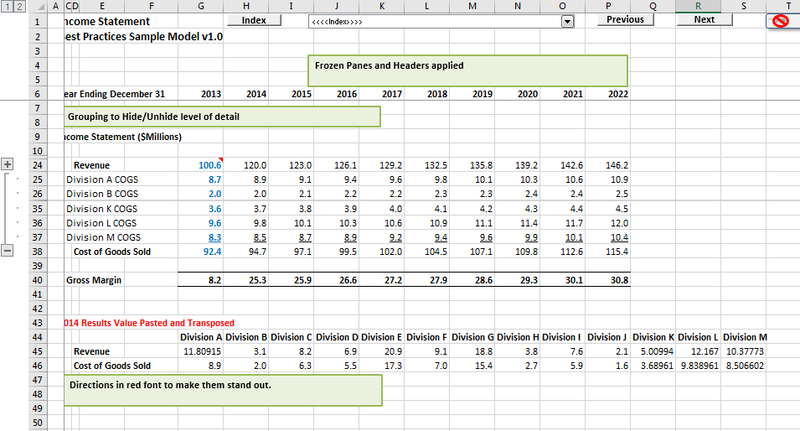 Formatting cells is one of the most time-consuming (and tedious) tasks in Excel. Master the keyboard shortcuts to quickly apply specific formatting! Virtually every Excel feature can be accessed from the Ribbon via ALT Accelerator shortcuts! Learn the most common ALT shortcuts! Excel has hundreds of powerful Functions. Spreadsheet Boot Camp focuses on the 70+ most common functions. 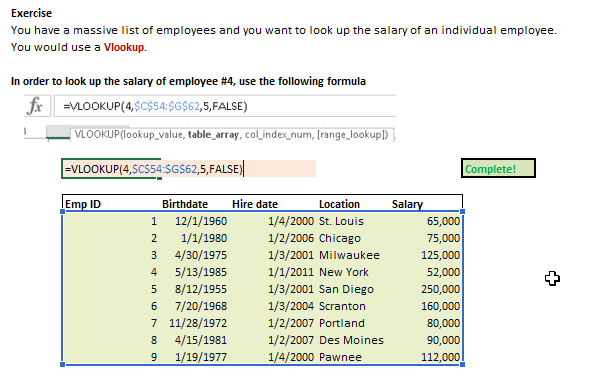 Learn about Vlookup, Hlookup, Index, Match, Offset, Indirect, and more! Our real-world examples will makes it easy to implement (and remember!) what you learn. Smart date functions allow you to enter a date once, and build all subsequent dates based on that first input date. Stop hard-coding dates into your spreadsheets! 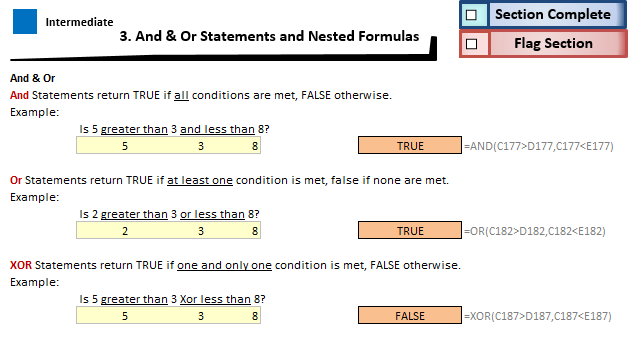 Logical functions allow you test if a condition (or conditions) is met. If so do one thing, if not do another. Learn IF, And, Or, Xor, IsError, and more! Named Ranges and other "Best Practices"
With Named Ranges you can refer to cells by using a custom name (ex. drate) instead of their row & column references (ex. A3). We will show you to create Named Ranges, when to use them, and other formula "best practices" to make your spreadsheets look more professional and reduce the chance of errors. Data Validation is a powerful tool to create drop-down menus, limiting cell inputs to certain values pre-approved values. Learn about Data Validation and other similar features of Excel to create professional looking spreadsheets that prevent errors and improve the User Interface. 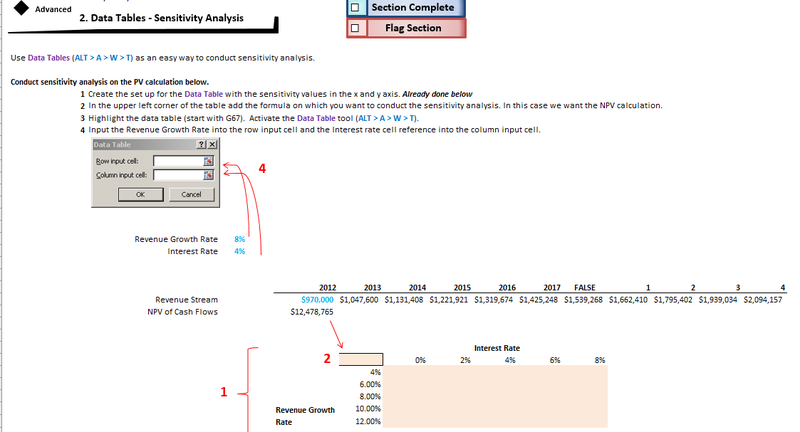 Excel's Data Table feature allows you to easily conduct sensitivity analysis. Learn about these and other financial modeling tools. When working with large data sets, it's essential to be able to Filter and Sort your data. We go beyond just the basics of filtering and sorting. We cover Wildcards, Advanced Filters, Custom Sorting, Left-to-Right sorting, and more. Review our sample model with "best practice" techniques highlighted in green boxes. Use these techniques on your own spreadsheets! Whenever we mention a tool or menu we also highlight it's corresponding shortcut directly next to it. We make it so easy to use keyboard shortcuts that you will begin using them without realizing it. Best Practices are guidelines developed by Excel experts to create easy to understand spreadsheets, reduce errors, and increase spreadsheet functionality. Throughout the tutorial, you'll find green boxes with "best practice" suggestions created by spreadsheet experts. 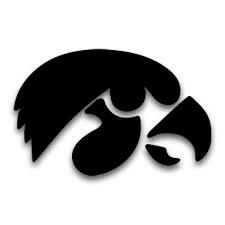 Each section can be marked as complete or flagged for further review. The Index Page tracks your progress, showing you which sections you've marked as complete or flagged. 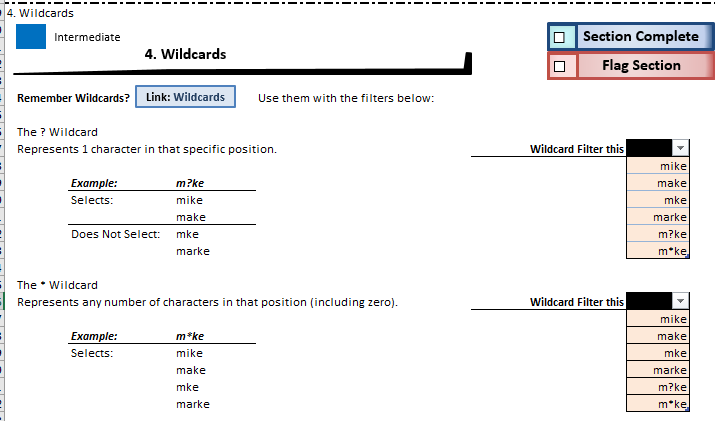 Each worksheet has an easy-to-use navigation bar at the top of the worksheet. You can easily return to the Index page at any time, navigate to the next (or previous) worksheet, or select a specific section to go to. Throughout the tutorial you will find links to related content, making it easy to recall previously learned topics. Most exercises are graded automatically as you complete them. Just look for the green "Complete!" when you've successfully completed an exercise. Stop wasting time in Excel! Get more done, in less time. Impress your coworkers and bosses. Get Started Now! Click the button below to receive your copy! "I did not really have much experience with Excel, but I feel that I learned more in this hour and a half than I did in all of my classes we had in school." Invest In Yourself: Create more free-time. Earn that raise or promotion. Taking the time to master Excel is an investment in yourself. You will be able to do more in less time, making you more valuable to your employer so that you can get a promotion or a raise. You will also benefit from the Halo Effect. The Halo Effect is the tendency for an impression in one area to influence opinion in another area. In other words, if you stand out because of our knowledge of Excel, your coworkers will assume you are more competent in other areas. The reverse is also true! If your Excel skills are below average, your coworkers (and boss!) will view your overall talent more negatively. Whatever time and money you spend to learn Excel, will repay itself several times over very quickly. On average, we expect it to take you 20 hours to finish Spreadsheet Boot Camp. 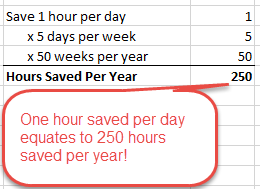 If you only spend 200 hours per year in Excel. You would only need to see a 10% improvement to "break-even" on your time in the first year! What about money? Depending on your salary, you would only need about a .1% additional raise to cover the cost of Spreadsheet Boot Camp. In many roles, if you can go from being an average Excel user to the best, the short-term raise(s) you receive could be worth thousands of dollars! That doesn't even factor in the long-term career prospect boost received from the Halo Effect! Don't wait! Make a commitment to yourself to advance your career and spend less time doing busy-work! Won't I just learn on the Job? "Won't I just learn on the job?" We agree! You can and should learn as you are working. Wondering how you can accomplish a specific task? Google it! But you can't just rely on this method because you don't know what you don't know. Over and over again, I've seen people struggling to complete certain tasks in Excel when there are built-in features that do exactly what they want. I cringe when I find out that they've been spending hours and hours doing manual work that Excel should be doing for them. If only they knew Excel's capabilities! After pointing them in the right direction they would have an "ah-ha" moment. Instead have that "ah-ha" moment ahead of time and save yourself hours of frustration! Spreadsheet Boot Camp gives you the base knowledge so that you can understand what Excel is capable of. You won't use every feature immediately, but you will keep them in the back of your mind, allowing you to recall them when needed. Have your "ah-ha" moment now with world-class Excel training and save yourself future frustration! Almost every shortcut worth knowing and "best practice" techniques to Excel like an expert! You are fully protected by our 100% Satisfaction-Guarantee. If you are unsatisfied for any reason over the next 30 days, just let us know and we'll send you a prompt refund. "I guarantee that you will see an instant improvement in your Excel skills." Excel Boot Camp is appropriate for Excel 2007, Excel 2010, Excel 2013, Excel 2016, and Excel 365. Can I use Spreadsheet Boot Camp with a Mac? No, Our training is geared towards PC users. Is Spreadsheet Boot Camp fun? Our hands-on training keeps you engaged as you work through the tutorial. We estimate that it will take most users between 20-30 hours to complete Spreadsheet Boot Camp. However, it will vary greatly from person to person.